Panel discussion with Dr. Leon Wainwright, Lecturer in Art History at The Open University, Terry Smith, Professor of Contemporary Art History and Theory at the University of Pittsburg, Tessa Jackson, OBE, and Dr. Anthony Downey, Programme Director, MA Contemporary Art. 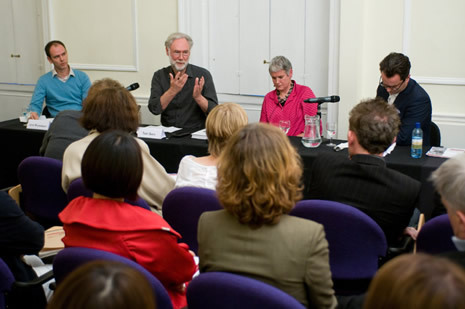 Sotheby’s Institute of Art – London held a panel discussion and a book launch of Contemporary Art: World Currents by Terry Smith on Wednesday 21 September 2011. Published by Laurence King, the book was launched by Sandy Nairne, Director, National Portrait Gallery. It is a nice paradox that the term ‘conceptualism’ came into art world existence after the advent of Conceptual Art – most prominently and programmatically in the exhibition Global Conceptualism: Points of Origin, 1950s-1980s (New York: Queens Museum, 1999) – mainly in order to highlight the fact that innovative, experimental art practices occurred in Russia, Japan, South America, and elsewhere prior to, at the same time as and after the European and US initiatives that had come to seem paradigmatic, and to emphasize that these practices were more socially and politically engaged – and thus more relevant to the present and better art – than the well-known EuroAmerican exemplars. Triggered by remarks made by some of the key artists back in the day (and some made, later, by curators), I wish to revisit the terms ‘Conceptual Art’ and ‘conceptualism’ as pointers to what was at stake in the unraveling of late modern art during the 1960s and in art’s embrace of contemporaneity since. See “The Art of Dissent: Ai Weiwei”, The Monthly, June 2011. Featuring an extract from the Introduction to Contemporary Art: World Currents (London: Laurence King; Upper Saddle River, NJ: Pearson/Prentice Hall, 2011). The following is taken from the Global Art and the Museum. Terry Smith is that rare art and social historian able to write criticism at once alert to the forces that contextualize art and sensitive to the elements and qualities that inhere to the works of art themselves. His most recent book, What Is Contemporary Art? (Chicago: University of Chicago Press, 2009), contains a series of interrelated essays that unpack a vast range of topics and issues and take the reader on a theoretical tour through some of the world’s most influential art museums, laying bare their conflicted missions and studying the heightening distinction, and dispute, between modern and contemporary art. Details about the Mather Award. The Frank Jewett Mather Award, first presented in 1963 for art journalism, is named in honor of the art critic, teacher, and scholar who was affiliated with Princeton University until his death in 1953. It is awarded for significant published art criticism that has appeared in publication in a one-year period; the 2010 award year is September 1, 2008–August 31, 2009. The Mather award may be given for work that originated before the indicated period provided that such work extends into the award period. The Frank Jewett Mather Award has been presented to many well-known art critics and writers. In the 1960s, awards were presented to Max Kozloff, Barbara Rose, and Clement Greenberg, while Lawrence Alloway, Rosalind Krauss, and Lucy R. Lippard were recipients in the 1970s. The Mather awards of the 1980s were given to Robert Hughes, Leo Steinberg, and Douglas Crimp, among others, followed by Eleanor Heartney, Arthur C. Danto, and Christopher Knight in the 1990s. Most recently, Boris Groys was honored for his essays in Art Power, which address curatorship and criticism of modern and contemporary art in public venues. In this clip in I explain some ways of approaching unfamiliar art that I use in my course Introduction to Contemporary Art. Professor Terry Smith at the Warhol Museum on Vimeo. The education department at The Warhol has developed some terrific curriculum material based around Warhol’s life and art, set in the context of his time. See: The Warhol: education resource center.